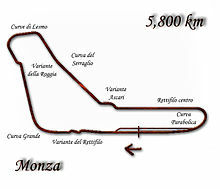 The 1992 Italian Grand Prix (formally the Pioneer 63o Gran Premio d'Italia) was a Formula One motor race held at Monza on 13 September 1992. It was the thirteenth race of the 1992 Formula One World Championship. The 53-lap race was won by Ayrton Senna, driving a McLaren-Honda, after he started from second position. It was Senna's third victory of the season. Martin Brundle finished second in a Benetton-Ford, with teammate Michael Schumacher third. Qualifying saw Nigel Mansell take his eleventh pole position of the season in his Williams-Renault, with Ayrton Senna alongside him on the front row in his McLaren-Honda. On Ferrari's home soil, Jean Alesi took third, ahead of Riccardo Patrese in the second Williams. Gerhard Berger was fifth in the second McLaren, with Michael Schumacher sixth in the Benetton. The top ten was completed by Ivan Capelli in the second Ferrari, Thierry Boutsen in the Ligier, Martin Brundle in the second Benetton and Bertrand Gachot in the Larrousse. Berger had a problem and was forced to start the race from the pit lane in the spare car. At the start Mansell took the lead ahead of Senna who just managed to stay ahead of Alesi then Patrese and Capelli. Schumacher had a poor start selecting a wrong gear and then hit a Ligier from behind at the first chicane. He had to pit for repairs at the end of the first lap. Patrese managed to overtake Alesi at the start of lap 2. The opening laps saw both Berger and Schumacher recovering many positions from the back of the field and overtaking a number of slower cars. At the front Mansell opened a gap with Senna unable to match his pace. The positions were Mansell, Senna with Patrese closing down on him and then the two Ferraris of Alesi and Capelli. Next Martin Brundle managed to overtake Capelli and moved into 5th position. Lap 12 proved disastrous for the Ferrari team with both cars retiring, Alesi, who was in 4th, due to a mechanical problem and Capelli spinning off at the Parabolica with electronic problems. On lap 14 Patrese overtook Senna and moved into second. Meanwhile, Berger pitted for new tyres and dropped back again. On lap 17 the situation was Mansell in first, 10 seconds in front of Patrese, then Senna at 2 seconds from the second Williams. Fourth was Brundle, some 28 seconds behind Mansell and then Boutsen and Herbert at over 40 seconds from Mansell. Lap 18 saw Herbert retiring from 6th with an engine issue. On lap 20 Patrese suddenly appeared in the lead as Mansell let his teammate take the lead. The order was Patrese followed closely by Mansell and Senna in third. Schumacher overtook Boutsen and moved into 5th place. Positions at lap 27 were: 1.Patrese, 2.Mansell, 3.Senna, 4.Brundle, 5.Schumacher and 6.Boutsen. As the lead trio lapped the slower cars of Berger and Comas Mansell continued to stay very close to Patrese and Senna tried his best not to lose contact with the two Williams cars as well, in fact he closed up on Mansell momentarily when the Williams had to take avoiding action of Comas at the Roggia. On lap 41 Mansell slowed through the Ascari bends and coasted into the pits with gearbox failure from loss of hydraulic pressure and had to retire. Classification at lap 44 was: Patrese, Senna at 6 secs, Brundle at 28 secs, Schumacher at over 50 secs, then Berger and De Cesaris both a lap down. Patrese led comfortably until 6 laps from the end he suffered a hydraulic problem, forcing him to slow down and concede the lead to Ayrton Senna. In the closing stages of the race Senna allowed his teammate Berger to unlap himself. Patrese limped to the end of the race and finished 5th. Senna won the race in what turned to be his last win with a Honda-powered car. The other places on the podium went to the two Benettons of Brundle and Schumacher. This was the last race of the season which featured more than 26 cars. Therefore, this was the last time of the season that failing to qualify/DNQ incidents occurred. The Andrea Moda team were refused entry to the Grand Prix and were thrown out of the Championship for bringing the sport into disrepute. The Fondmetal team pulled out of the sport after this race. Nigel Mansell announced his retirement from Formula 1 on the morning of the race, as rumors had said that Williams had already signed Alain Prost for the next season as well as known to be attempting to sign Ayrton Senna. Angered and hurt by this, he decided to announce his retirement despite being told minutes before the press conference that he would be able to partner Prost. Prost and Mansell had had a fiery partnership at Ferrari in the 1990 season. 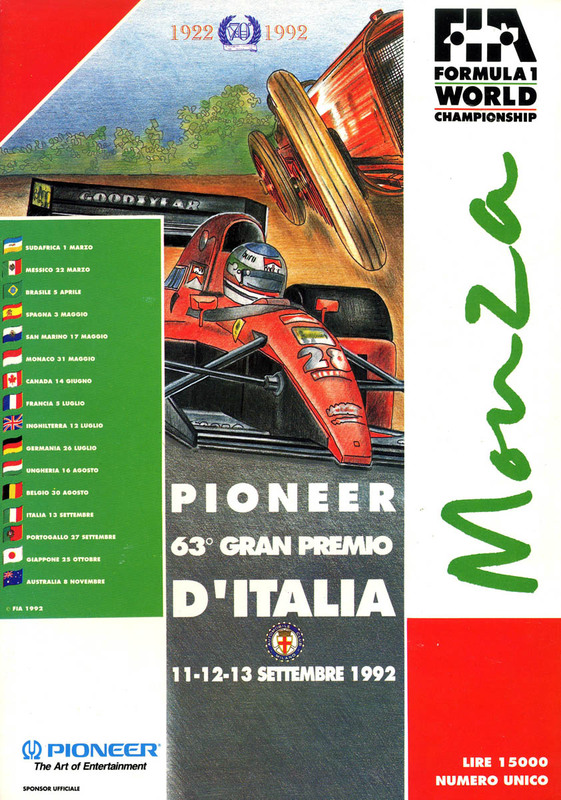 ^ "Motor Racing Programme Covers: 1992". The Programme Covers Project. Retrieved 12 November 2017. ^ "1992 Italian Grand Prix". formula1.com. Retrieved 8 November 2017. ^ a b "Italy 1992 - Championship • STATS F1". www.statsf1.com. Retrieved 18 March 2019.